The Giants, were the chief enemies of the gods, particularly the Aesir. In the Norse world, a giant was called Jotun or Iotun. There are several different types of giants. The frost-giants were the most common giants; they lived in Jotunheim, one of the nine worlds. The capital of Jotunheim was Utgard, the citadel of the frost-giants and home of Utgard-Loki or Utgardaloki. Often writers just simply called the home of the giants as Giantland. Giantland or Jotunheim was supposedly large world, but void of actual physical geographical location. All that we know is that Giantland was east of Midgard, separated by rivers and the forest known as Jarnvid (Iron Wood). Jarnvid was inhabited by troll-wives, known as the Jarnvidjur, where they breed giants in wolf forms. There are many places within Jotunheim other than Utgard. The giant Hrungnir lived in a frontier of Giantland, called Griotunagardar. The giant Thiassi lived on the mountain called Thrymheim, with his daughter Skadi. The other giants were the fire giants, who lived in Muspelheim. The fire giant named Surt ruled in Muspelheim. Note that some of the giantesses had become deified because of the their relationship with the Norse gods, like Jord, Grid, Gerd and Rind. These giantesses became Asyniur or goddesses in their own rights, so I have list some of these in this page and some in the Aesir page. Many of the Aesir also had heritage from the giants, where at least one parent was a giant or giantess. These included Odin, Thor, Tyr and Heimdall. Perhaps the most important of these giant/god was Loki. Both of Loki's parents come from the race of giants, yet he was considered by most as an Aesir god. Loki became the leader of the frost giants at the time of Ragnarök. Giants and giantesses were sometimes called troll and trollwives. The first primeval giant was generally known as Ymir. The frost-giants called him Aurgelmir. Ymir was the first creature created in the universe. Ymir was father of the race of frost-giants. The frost-giants were born from the sweat of his armpits. First, Ymir was father of six-head giant (unnamed) that was nourished by a giant cow, Audumla. Audumla found nourishment through licking stones. This stone shaped like a man, became the primeval god, named Buri. Buri was the father of another primeval god (or giant) Bor. Bor and Bestla became parents of the 3 gods: Odin, Vili and Ve. Odin and his brothers, Vili and Ve, had killed Ymir. They used his body to create the world (universe). His skull was used to create the heaven and his eyebrows to create Midgard, or Middle Earth, home of the mankind. Ymir was also the father of Thrudgelmir and the grandfather of Bergelmer. Audumla, Buri, Bor, Bestla, Odin, Vili, Ve. The ancestor of the gods. Buri was created from a stone or ice that the giant primeval cow, Audumla, licked into shape. Buri was the father of Bor and the grandfather of the three original Aesir gods: Odin, Vili and Ve. There are some uncertainties if Buri was a god or a giant. Primeval god. Bor was son of giant Buri. Bor was probably more of primeval god than a giant. Bor married a frost-giantess Bestla and became the father of the three Aesir gods: Odin, Vili (Hoenir) and Ve. Buri, Bestla, Odin, Vili, Ve. Bergelmer (Bergelmir) was the son of Thrudgelmir and the grandson of Ymir (Aurgelmir). When the gods killed Ymir, his blood flooded the world, drowning all the frost giants, except for Bergelmer and his wife. Surviving the flood, Bergelmer became the ancestor of new race of frost-giants. Fire Giant. Surt dwelled in Muspelheim, the world (region) of fire, said to be located far to the south. Surt ruled Muspelheim and was leader of the fire giants. In Ragnarök, he killed Freyr, the first of the god to die. Surt ended the battle, by setting all Nine Worlds on fire. Destroying almost every creature. Vafthrudnir was the wisest of giants, according to one of the poems from the Poetic Edda – Vafthrudnismal ("Vafthrudnir's Sayings"). Apart from Vafthrudnir being the son of the giant Im, not much is known about Vafthrudnir. He is not mentioned in any other poems. Vafthrudnir was involved in a game of questions and answers, between himself and Odin. However, Odin had disguised himself as human wanderer, calling himself Gagnrad, and seeking Vafthrudnir's wisdom. Vafthrudnir accepting Gagnrad's challenge, only recognising Odin at the end of the poem, when the giant couldn't answer the last question from Odin. See Vafthrudnir: Contest of Wisdom in the Search for Wisdom. Hrimthurs was the giant who built the walls around Asgard and owner of the intelligent and magical stallion called Svadilfari. Hrimthurs claimed he could build the wall within six months. Had Hrimthurs won, the giant would receive Freyja as his bride, as well as the sun and moon. Thor killed Hrimthurs when he lost his wagers against the gods. See building of Asgard, in Norse Creation, for full story. Giant. Thrym ("crash") was the ruler of the giants in Jötunheim (Jotunheim). He had stolen Mjollnir, the magical hammer of Thor. Loki found out from the giants, that Thrym will return the hammer to Thor, if he was allowed to marry Freyja. It was Thor who dressed himself in bridal gown that went to Jötunheim, instead of Freyja. During the feast, Thrym and the other giants was stunned when they saw Thrym's bride (Thor) ate an ox, eight salmons, and three large tankards of mead. Loki made a silly excuse, telling Thrym that Freyja had not eaten in eight days, because she was excited to be wedded to the king of giants. When Thrym peeped under his bride's veil, the giant was taken back by the fire in Freyja's (Thor's) eyes. Again, Thrym demanded explanation from Loki; Loki answered that Freyja was just excited about the wedding. When Thrym had the hammer brought in and placed it on his bride's laps, Thor threw off his disguise and attacked Thrym. Thor killed Thrym and all the giants within the hall. Hrungnir was a giant from Griotunagardar, frontier of Giantland. He was considered to be the strongest giant in the world. His head and heart was made of stone. Hrungnir owned a horse called Gullfaxi ("Golden Mane"), the fastest horse in the Giantland, but Odin boasted that his horse (Sleipnir) was better. This led to Hrungri declaring he would move Valhalla to Jötunheim, destroy Asgard and all the Aesir gods, except for Freyja and Sif, whom he would take as his concubines. Thor challenged him in a duel, but Hrungnir has come to Asgard unarmed. Hrungnir told Thor to meet him at Griotunagardar. The other giants created a giant made of clay, which they called Mokkurkalfi. They hoped to use Mokkurkalfi to frighten Thor, with enormous size; Mokkurkalfi stood nine leagues high and three leagues wide. Armed with a large whetstone, he hurled it at Thor. Though, Thor's Mjollnir broke the whetstone in half, one of the piece was lodged in Thor's head. The Mjollnir shattered Hrungnir's stone head and fell dead on top of Thor's neck. Thor could not push Hrungnir off him, but Magni removed Hrungnir's body off his father. Thor gave Gullfaxi to Magni. See Giant of Clay for more detail. Thor, Odin, Freyja, Sif, Magni. Sleipnir. Frost-giant. In some tradition, Hymir was the father of the war-god Tyr, like in the Hymiskvida, a poem found Poetic Edda. The usual tradition says that Odin was Tyr's father. The Hymiskvida was slightly different from the version found in the Prose Edda (written by Snorri Sturluson. The poetic version say that he possessed a magic cauldron, which Thor needed to fetch, so they can brew almost unlimited supply of ale for Aegir's feast. Snorri left all details about the feast and cauldron out of his story. Thor and Hymir went on a fishing trip, where the giant caught two whales. Hymir was terrified when Thor caught Jörmungand, the Midgard Serpent. Either, Thor killed Hymir when the frightened giant cut off Thor's line in the Snorri's Edda, or Thor killed Hymir when the giant tried to retake the cauldron from Thor in the forest. A frost giant. Geirrod ("spear-rider") was the father of two giantess – Gialp ("yelper") and Greip ("gripper"). Geirrod and his two daughters tried to kill Thor. Though Geirrod managed to get Thor to leave behind his weapon, Thor received an unbreakable magic staff; a girdle of might and iron gauntlets from a giantess named Grid. Thor used the staff to defeat Geirrod's daughters, and the iron glove (Járngreipr) to kill Geirrod. See Geirrod in Of Thor and Giants for more detail about Thor's adventure. Note that Geirrod, the giant, should not be confused with the king in Grimnismal ("Grimnir's Saying") of the Poetic Edda. A frost-giant. Thiassi was the eldest son of Olvaldi or Allvaldi, and the brother of Idi and Gang. His father was very rich and lived in Thrymheim. At his death, the land was divided between the three brothers. Thiassi had the ability to turn himself into an eagle. Thiassi had a beautiful daughter named Skadi. Thiassi was the giant who had abducted Idun, keeper of the apples of youth, with the help of Loki. Loki was later forced to rescue Idun. Thiassi pursued Loki to Asgard in a form of a giant eagle, but was killed by the Aesir, as he passed over the wall of Asgard. Skadi would have avenged her father, had the Aesir not made peace with her, by offering to her an Aesir husband. Odin had also taken Thiassi's eyes and threw them in the sky, and two new stars were created. A frost giant. Suttung ("sup-heavy") was the son of the giant Gilling. When two dwarfs, Fjalar and Galar killed his parents, Suttung threatened to kill the dwarfs in revenge. Suttung only relent when they the Mead of Poetry as compensation. Suttung set his daughter Gunnlod to guard the precious mead, but she betrayed him, when Odin copulated with her for three nights. Odin drank the whole mead, after three days before escaping to Asgard. Suttung had the ability to transform himself into an eagle and pursued Odin. However, Suttung could neither capture Odin nor recover the mead. See the Mead of Poetry. Gunnlod, Fjalar and Galar, Odin. In the Norse myth of Ragnarok, Hrym was the giant who captained and piloted the ship, Naglfar. Naglfar was made of the untrimmed nails of the dead. Hrym would bring the frost giants from Giantland to the plain of Vigrid. According to Snorri, Hræsvelg was a giant who lived the northernmost end of heaven. When Gangleri, an alias used by Gylfi, king of Sweden, questioned the mysterious 3 gods in the Prose Edda about where the winds come from, they answered that Hræsvelg would transformed himself as a gigantic eagle. When Hræsvelg flew, the flapping of his wings would caused the winds to blow. The giant living in the forest and mountains from Lungbardi (Lombardy), who appeared in Thidrekssaga (c. 1200). Aspilian ravaged some of the farmlands, owned by the monastery. Aspilian challenged the abbot to send him a warrior to face him, if the monks wish to recover the stolen land. At the time, the hero Heimir was staying in the monastery, to repent from his past sins. Heimir once again, took up the weapon, killing the giant with his sword, Naglhring. Heimir was reunited with his old friend, Thidrek, when the king heard the news on the death of Aspilian. Giantess. Bestla ("wife" or "bark") was the daughter of the frost giant Bolthor. Bestla became the wife of the primeval god, named Bor, the son of Buri. She was the mother of the three Aesir gods: Odin, Vili and Ve. Bor, Buri, Odin, Vili, Ve. Frost giantess. Through Loki, she was the mother of Hel, goddess of the dead, the Midgard Serpent (Jörmungand), and Fenrir, the giant wolf. Loki, Hel, Midgard Serpent, Fenrir. A frost-giantess. Skadi was the beautiful daughter of the giant Thiassi (Thiazi), from the mountain of Thryheim. Skadi was about to go to war against the Aesir, when the gods killed her father. The Aesir made peace with Skadi, only if one of them could make her laugh and that she had a choice of choosing a husband among the Aesir. Loki easily made her laugh, but the choice of husband little more difficult. Skadi had to choose her new husband by his feet. She thought she was choosing beautiful Balder, when he chose the god with beautiful feet. Instead her new husband was Njörd (Njord). The marriage did not last long, because Njörd preferred to live in Noatun at the sea, while Skadi preferred her mountain home in Thrymheim, so they divorced. Sometimes, Skaldi was mistaken as the mother of Freyr and Freyja. Skaldi was usually described as their stepmother. Skadi was later married to another Aesir god, named Ull. However, in the Ynglinga Saga, Snorri Sturluson wrote that when Skadi remarried, she had married Odin, not Ull, and supposedly had many children with Odin. Like Gerd and some other giantesses, Skaldi became an goddess and an Asyniur. Skadi became the goddess of mountain, or of skiing and snowshoes. Thiassi, Njörd, Ull, Loki, Balder. Frost-giantess. Grid ("peace") was the friendly giantess who warned Thor of Geirrod's treachery. Thor was going to the home of Geirrod, unarmed, since Loki had persuaded Thor to leave the Mjollnir at home. Grid gave Thor her magic staff (Grídarvöl), as well as her own pair of iron gloves (Járngreipr) and her girdle of might (Megingjord). Thor used Grid's gifts to defeat and kill Geirrod and her evil daughters. See Geirrod in Of Thor and the Giants. Grid was the mother of Vidar by Odin. Grid made special shoes for her son, which Vidar wore and defeated Fenrir, at Ragnarök. Odin, Vidar, Thor, Loki, Geirrod. 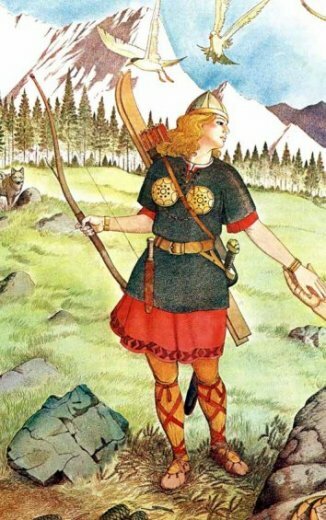 Gerd was a giantess, whom became wife of the Vanir Freyr. Gerd was the daughter of the mountain giant Gymir and Aurboda. Gerd may have an unnamed brother who was killed. Freyr fell in loved with Gerd, when he sat on Hlidskialf, Odin's throne in the hall called Valaskialf. Hlidskialf allowed the person to see the entire world, no matter the distance. Freyr sent his shield-bearer, named Skirnir, to woo her for him. At first, Skirnir offered rich gifts to Gerd, which she refused, claiming to dislike all the gods. Not even when Skirnir threatened to cut off her head with Freyr's sword, cause her any fear. It was only when Skirnir threatened to put a curse, to make her old and ugly, that she even considered meeting Freyr in nine days later at a grove called the Barri. Though the story never says that Freyr and Gerd married, other writers say that they had a son named Fiolnir. See the Wooing of Gerd. Gerd became a goddess of light, and was a Asyniur in her own right, like the giantess Skaldi, Freyr's stepmother and the second wife of Njord. Gerd, Gerð, Gerda – "enclosure". Giantess. Jarnsaxa or Iarnsaxa was mother of Magni and Modi, by the Aesir Thor. Not much is known about Jarnsaxa, except that she was Sif's rival for Thor's love. All references to Jarnsaxa have to do with either Thor being her lover or Magni being her son. Her parents are unknown. Her name means "iron sax". Her name appeared in Sturluson's list of giantesses, and in a couple of Eddaic kennings. Every difficulty increases Iarnsaxa's wind in Olaf's father, so that praise is due. Here, Iarnsaxa's wind means "courage". In this kenning, the dark-looking steed of Iarnsaxa indicates her steed was a wolf. Thor, Magni and Modi, Sif. A giantess. Gunnlod ("war-summon") was the daughter of the giant Suttung. Gunnlod was the Keeper of the Mead of Poetry. When her father had gained the Mead of Poetry, Suttung had set her to guarding the magic mead in a cave. When Odin gained entry to the cave, Gunnlod was willing to give Odin drink the mead, but he was required to sleep with her. So Odin slept with her for three nights, and the god drained the mead from the three vessels. Fenia and Menia were two giantesses who served as slaves to King Frodi of Denmark in the poem of Grottasong or the "Song of Hand-Mill" – a poem in the Poetic Edda, but Snorri Sturluson included in his version of the story, the death of King Frodi. Frodi was a son of Fridleif and grandson of Skiold. Skiold was the founder of the Danish dynasty, known as the Skioldungs. Skiold was a son of Odin. Frodi was famous king because he was the one who brought the Frodi's Peace to the northern countries, just as his contemporary Augustus brought the Roman Pax (Roman Peace) to the Mediterranean and other provinces. Therefore, Frodi lived in the time of Christ. His residence was in Denmark, but at that time his kindgom was called Gotland. His reign also brought great wealth to the kingdom. One of the reasons for Frodi's immense wealth is that he had bought two female slaves from King Fiolnir of Sweden, to work in the mill, which is called grotti. This mill can produce just about anything, and one of the things that the mill usually produces for the king is gold. This is the reason why gold can be identified as "Frodi's Meal". The slaves were actually giantesses. They were given no rest, producing item after item. Though, Frodi's Peace came to an end, when Mysing, a sea-king (Viking), murdered Frodi, this didn't ended the slavery of Fenia and Menia. Mysing was just as merciless as the giantesses' former master; he forced Fenia and Menia to work day and night, without rest. They continued to work in the mill, but on Mysing's ship. It was salt that Mysing desired; not gold. No pleas for break from work, so Fenia and Menia grinded out salt from the mill. They produced so much salt that the ship eventually sank, drowning Mysing, his crew and the two giantesses. The poet explained that this was the reason why the seas were salty bodies of water. Grottasong ("Song of the Hand-Mill" Grotti) – was a poem in Poetic Edda. Grottasong can also be found in the Prose Edda, written by Snorri Sturluson.